My other paper is The Financial Times. The reason that it never features in these columns is that, by contrast with the (quite possibly non-existent) sub-editors of The Times, the FT‘s subbies are excellent. The FT is a paper of record for finance and business, and mistakes are therefore rare. When a mistake is made, however, it is likely to be a lulu. It will be something as blindingly obvious as the (possibly apocryphal) architect who forgot to include a staircase in his design. And so it was this very morning, top-right in the masthead on the front page. Janan Ganesh is the paper’s established and very readable political correspondent and, incidentally, author of a fine biography of George Osborne. Sorry about the distributor’s sticker. 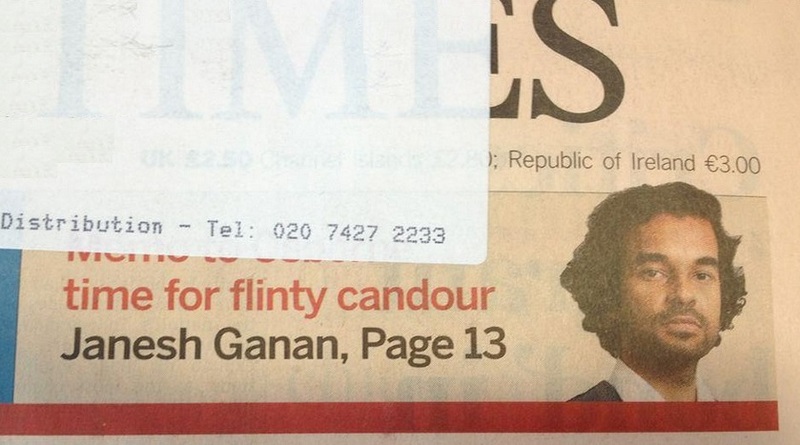 The whole thing reads: “Memo to Osborne: time for flinty candour”. The FT awaits the revenge of the elephant god. Thanks to George Eaton and Guido Fawkes for this.